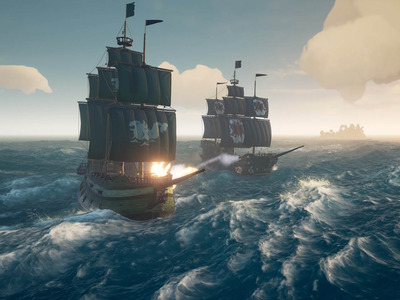 Rare/Microsoft‘Sea of Thieves’ is included on the Xbox Game Pass. Microsoft is planning to roll out a monthly Xbox subscription service called “Xbox All Access” according to Windows Central and The Verge. The subscription would include an Xbox console, Xbox Live Gold and Xbox Game Pass subscriptions – and it would be cheaper than buying each item individually. It will reportedly only be available to gamers in the US, but if it does well it could be rolled out into new markets. The new service was teased by The Verge journalist Tom Warren in early August. Windows Central corroborated the story, and reportedly customers will be able to get an Xbox One S for about $US22 per month over 24 months, or a more powerful Xbox One X for about $US35 per month. In addition to the console, Xbox Live Gold is a subscription that gives players access to online multiplayer, and subscribers to Xbox Game Pass gain access to an array of games. Moreover once the 24 months are fully paid players will own the console outright. Both Windows Central and Tom Warren report that the service will initially only be available in the US, but Warren notes that if the service does well it could be rolled out in other markets. An Xbox One S currently costs around $US250 with a free game. An Xbox Live Gold yearly subscription currently costs $US59.99, and the Game Pass is $US9.99 per month. All purchased individually over two years, the three add up to just under $US610. This means that over a two-year period the All Access subscription would work out about $US80 dollars cheaper.